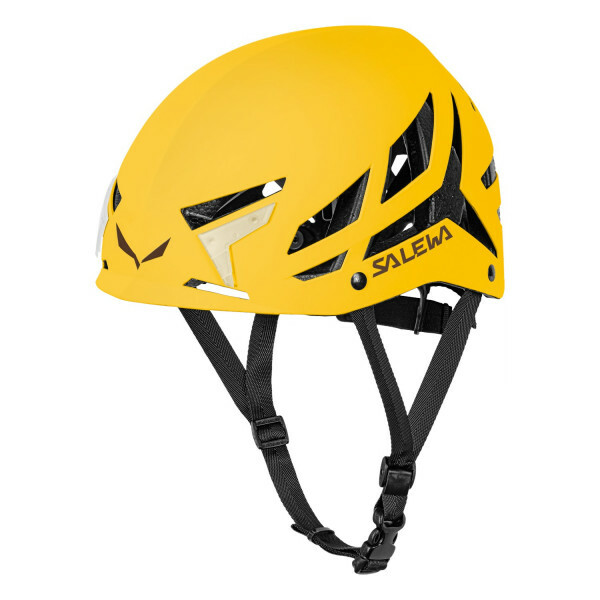 Setting new standards, the best ever SALEWA helmet is light and boasts uncompromising protection, comfort and style. The Vayu helmet is lightweight, comfortable and offers superior multi impact protection in a compact design. Its strong Carbon Nano Tech (CNT) polymer-ceramic composite outer shell provides good durability and protection against repeated bumps and knocks. Made using cutting-edge technology, it offers a very high strength-to-weight ratio. Inside, the EPP (expanded polypropylene) one-piece inner shell has superior energy absorption and provides resistance to multiple impacts from both the top (stone and ice fall) and off centre (climber falls). In addition, big vents offer excellent ventilation all around the helmet and the easy-adjust chinstrap adapts to all head shapes. With integrated headlamp clips and removable, washable padding.